Normally when a celebrity hits a new popularity milestone on social media, they’ll post a picture thanking their fans, but that wasn’t the case for Dyro. Part of the new wave of musical masterminds hailing from the Netherlands, Dyro has blown up exponentially in the past six months. Whether it’s dropping a gorgeously mastered Beatport Top Ten track like Calling Out, or launching his own label “Wolv by Dyro” at MMW in March, Dyro’s taking the dance music world by storm. 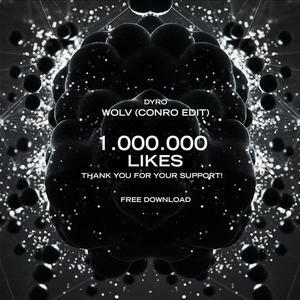 To celebrate his one millionth like on his Facebook page, Dyro decided to release a fresh edit of his new track: Wolv (Conro Edit), and we’re infatuated with every second of it. The track kicks off with an upbeat bassline, and along that it utilizes synthetic fragments to crescendo into an impactful section of sustained synthetic chords, ultimately creating a melody that harmoniously layers to a drop so propelling and intense that it’ll consume your mind and body. Dyro’s promising track record has caught our attention, and we’ll be keeping an eager eye on his future endeavours. I wwant to to thank you for this wonderful read! !